Are you looking for the Best Demat and Trading Account in India? Thinking, which is the best stock broker offering impeccable services to its customers? Don’t worry, your search probably ends here. 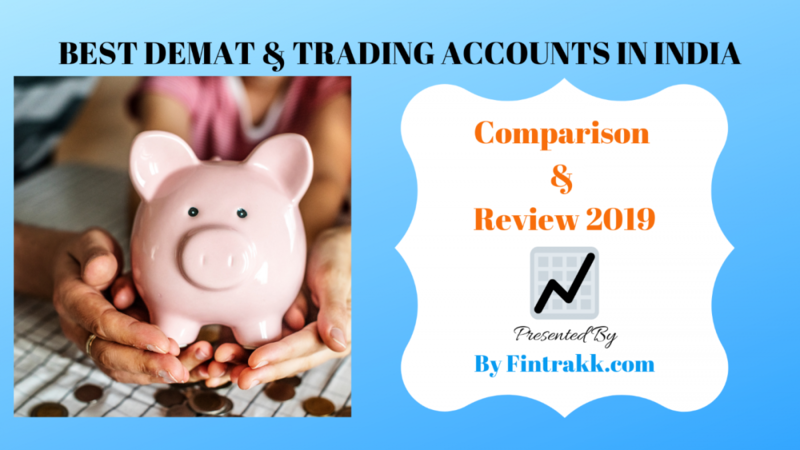 Go through our exclusive list of Best Demat and Trading Accounts in India: Comparison and Review. Choose the most affordable and the best stock trading platform that suits your requirements. This collection includes both Full Service brokers as well as discount brokers in India. While historically, full service brokers like ICICI, Kotak etc. have been the pick for the investors, 2018 brought a paradigm change. The discount brokers now provide a whole lot of services apart from share sale and purchase at a fraction of cost. So, we have sufficient enough reason to believe that the year 2019 belongs to discount brokers like Zerodha and 5paisa. May be some new and emerging players like Paytm Money join this group soon. Stock trading has come a long way since the inception of Stock Exchanges in India. Back in 90s and early 2000s, one had to majorly rely on the brokers in the locality to place and execute phone orders. In fact, they were actually sub-brokers to some brokerage houses since becoming a broker with SEBI wasn’t that easy. However, as the technology advanced and stock investments and trading became more mainstream. As a result, the trading accounts also became more mainstream. If you are someone who started or worked in stock trading or investing in late 90s or early 2000s, you might have mainly traded through traditional brokerage houses like ICICI direct, Sharekhan, Indiabulls etc. These brokers provide you with a trading account to invest as well as invest in market securities. So, they used to charge some percentage of the trade amount being executed and are also called as full service brokers. As the technology revolution took over in the first decade of 2000 and the volumes on the stock exchanges further increased, the revolution started disrupting the brokerage space as well. We saw a slew of modern age tech driven brokers which charged mostly a flat fee for the brokerage. Some common names you get to hear in this field are 5 Paisa, Zerodha, Upstox (RKSV), Angel Broking, Pro stocks etc. These stock brokers charge very low fee and sometimes even a zero fee on stock delivery. Have a look at the Best Trading and Demat account options in India that are available for retail Indian investors. So, this list has been crafted especially for the ones who want to trade or invest in the stock markets. A Trading account is the account which is used to place orders on the stock exchange. If you intend to buy some stocks or work in derivatives, you must have a trading account to do so. Now, once you have placed an order on the stock exchange and have been allotted stocks, the stocks must be stored somewhere, right? This place where the stocks are stored for you in the digital format is called as Demat Account. Demat is the short form of “Dematerialized Account” that signifies that stocks are held in electronic form and not in any material form. 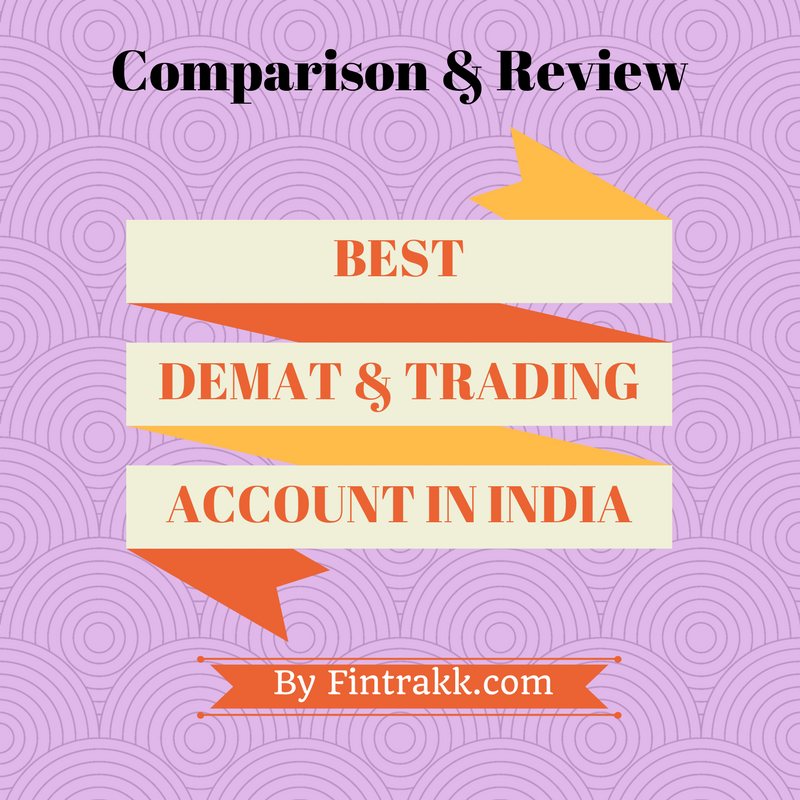 Now, let us have a look at some of the Best Demat and Trading Accounts in India. Also, know what does it cost to have one (Please note that we are analysing here only for the equities segment). Zerodha is the pioneer of online based discount brokerage in India. This is one of the largest discount brokers in India based on the active number of clients. Do you know, Zerodha was the very first to come up with the discount broking model. It started charging a flat fee which is not based on the size of trade initiated at all. This means, whether you set up a trade with 10K value or a trade with a 1 Cr value, the brokerage would be the same. Moreover, they didn’t just stop at discount brokerage gig. And, they went ahead to make the equity delivery trading free of cost. This helped reduce the barrier for retail investors in stock market. Trade all segments on BSE, NSE, BTST, MCDEX, Forex Trading Spot Trading, Mutual Funds etc. Zerodha Brokerage is a flat fee structure with charges of Rs.20 per trade. Stock Delivery is charged free of cost. No doubt, Zerodha has gained immense popularity and has grown its user base substantially. India Infoline is a full service broker offering 2-in-1 demat and trading account on its online platform 5paisa.com. This is also popular as the 2nd largest discount broker in India. Trades in all the segments of BSE, MSE, MCX and NCDEX, IPOs and Mutual Funds. It has distinctive features in the platform like Equity SIP. They have good Mobile apps for trading. Angel Broking is one of the other popular full service brokers in India. They also have a PAN India presence and a number of sub-brokers across India. This is quite feasible if you want to place order via a broker call instead of placing through the online account. There are no account opening charges for trading and demat account opening at Angel Broking. Trades in all segments on NSE, BSE, MCX, NCDEX. Browser and app based trading with Angel Eye, Angel SpeedPro, Angel Swiftland, Angel Lite.They recently launched ARQ advisory services for an optimized portfolio. Angel broking has multiple plans (Angel classic, Angel Preferred, Angel Premium and Angel Elite). You can pick up the plan as per your trade volume. The brokerage will vary along with that. ICICI Direct has been preferred online broker choice since ages now for generations. Carrying an ICICI brand name and a long history, ICICI direct is a trust choice for retail investors whether it is about stock investing, mutual funds, corporate bonds or anything which is traded on the markets. The account is actually a 3-in-1 account i.e a trading account, Demat Account and the bank account that you can easily open online. ICICI Direct account can be opened at a flat fee of Rs 750. It includes everything i.e trading, demat and the bank account(if you wish to). Trade all segments on BSE, NSE, NSE, BTST, Spot Trading, Mutual Funds, Term Insurance, IPOs. ICICI Direct is one of the expensive brokers out there. There are a couple of plans that ICICI Direct offers i.e ICICI Direct I-Secure and ICICI Direct I-Saver Account. Equity Options – Flat Rs 95 to 35 Per contract lot. Currency Options – Flat Rs 25 to 10 Per lot Brokerage on second leg of Intraday square off Rs 10. The pricing is complex and should be studied diligently to avoid any surprises later on!! You may also like: 7 Best Long term Investments in India! Sharekhan is another popular online broker and has been popular for quite some time now. In 2015 it was acquired by the French company BNP paribas and it continues to be a preferred choice for many investors looking forward to trade on the markets. All trading options : Equities, IPO, F&O, Currency, Commodities.It has a simpler pricing structure.There is a prepaid option to reduce the brokerage for a certain amount of time. There are no payment gateway charges, to and from bank. Intraday charges: 0.1% on both buy and sell sides subject to minimum of 5 paise per share. Equity Delivery Charges: 0.5% on both buy and sell sides subject to minimum of 10 paisa per share. For sell delivery, brokerage of Rs 16 per scrip is charged for orders less than Rs 3200. Equity Futures: 0.1% for the first leg, for second leg: 0.02% on same day square off and 0.10% any other day. Options: Rs 100 per lot or 2.5% of premium(higher one). All Taxes are charged extra. Indiabulls ventures is also one of the popular full service brokers providing access to trading and demat account. Trades in all segments of BSE, NSE, NCDEX and MCX. It has great Mobile app and dedicated relationship managers to support their services. Just like other players from banking sector, Kotak also offers a 3-in-1 demat and trading account for the prospects. Kotak Securities is a full service broker. It offers a whole lot of services including but not limited to Equity Delivery, Equity F&O, IPO, Financial Advisory services, mutual funds, life insurance, investment banking etc. They are depository participants with NSDL and CDSL both. Demat Acccount Maintenance Charges: Rs 50 per month. Kotaksecurities.com : Online website for stock trading and investment. KEAT Pro X : The desktop tool for professional traders. Kotak Stock Trader: A mobile app for the one’s who like to trade on the go ! Kotak Securities offers multiple brokerage plans vis-a-vis dynamic, fixed, silver and pearl brokerage plans. We have covered the brokerage for the most common plans i.e fixed dynamic brokerage one in this blog. I hope you enjoyed gaining knowledge on the Best Demat and Trading Accounts in India and found the post helpful. All the information and charges given are on “as is ” basis. You must check the respective broker site for any amendments though. Duties and Taxes are all extra. This post contains affiliate links. We might earn a small commission (of course, at no additional cost to you). Thanks for supporting our blogging adventures! Disclaimer: There is a high degree of risk involved in stock trading. The details given on this website are for informational purpose and cannot be constituted as professional advice in any regard. Please follow due diligence while investing your money. Have you opened a Demat or Trading Account with any of the stock brokers listed above? While selecting the best demat and trading accounts in India, do thorough research. Now, what do you think? Which is the best stock broker in India? Do share your valuable feedback and experiences on the same in the comment section below. I have recently opened a Demat account online.I didn’t know it was so easy to open one.Good to see these automated services offered by various brokers.Thanks for sharing info. Yes Suresh,Online Brokerages have changed the landscape of trading in India. Its now very much convenient at fraction of charges that the brokerages used to charge in early days. Very true Sir,things like opening a trading account have become easier and more convenient with technology moving at such a faster pace. I opened a demat Account with Zerodha. Had a really good experience. The brokerage is very low and I am saving a lot of money. Zerodha Charges zero for equity investments. Hi Gaurav,Thanks for your feedback.This will help our readers to take a wise decision. Hello sir, even I want to open an account with Zerodha. Will you help me out? Hello Sir, Our articles are for information purpose.We have no role in opening of the account.You can apply for Zerodha account through their link given in this post.Their customer support shall respond and help you with further procedure for opening the account.Thanks. Does Zerodha charge any demat account maintenance charges yearly or not? You don’t need any help. It’s a very easy online process.Open Demat a/c using AADHAR just so simple and quick. What about upstox, any idea? Any feedback on it. Hi,I am planning to invest in share market and have very little knowledge about it.Please guide me on a suitable brokerage house.I need suggestion for minimum charges trading platform. You should join brokers like TradingBells. I joined there as a fresher and got a lot of knowledge ,moreover learnt strategies to work in share market. I have recently opened a Demat account with Zerodha. I am having a good experience.They have a good customer support as well. I have recently opened a 5paisa Demat account.I found it to be a good online platform.There customer support is also quick and helpful. Thanks for sharing this list of best demat account in India.I have recently opened a demat account with 5paisa. I was amazed to see such a good technical platform.They also have a good customer support. I have recently opened a demat account in a hassle free manner.The opening process has become quite simple with online brokers. I am a beginner in the share market and opened a trading and demat account with Zerodha.Their staff explained to me how the share market works in detail. Their after sales support team is very good and always ready to help whenever I face any problem in trading. Thanks for sharing your feedback.This will surely help our audience. A good trading platform with lower brokerage charges is what one looks for while selecting a demat and trading account.Got some useful details to increase my knowledge on demat accounts.Thanks. It is really an informative article.Thank you. Hi, I am looking for an option where I can invest one time for long term. I am mainly concerned with DP Annual charges.Can you please guide. Any feedback on Kotak securities demat account will be much appreciated. Why there no Samco in the list. It’s also a discount broker. Thanks for this great list.Its really helpful for a common man. What about Trading Bells? Is the broker worth looking at or do you think that one should go for Zerodha or 5paisa only. Zerodha seems to be a good choice. Online trading is basically the act of buying and selling financial products through an online trading platform. These platforms are normally provided by internet.Instant access to your account through browser-based interface application. Intra-day, Overnight, Short-term and Long-term investment calls are provided directly on the Trading screen and via SMS on different platforms. Hi,thanks for sharing this informative post.Its true one needs to be careful while investing his money.A well planned investment strategy and good investing platforms can help to gain. This one is surely a massive list of the best brokers in India. I am a client of Angel Broking for more than 2 years and they served me very well in these years. Whenever I have a complaint they called me and immediately solved it. I heard a lot about Zerodha also recently from my friends. They are also performing well in terms of services and customer support. Zerodha is the best broker for opening Demat account.My experience has been great with them. Their charges are too low in comparison to other brokers. Zerodha is the best. Zerodha is the best broker for opening Demat account.My experience has been good with them. Both 5Paisa and Zerodha are good platforms. A good list of Demat and Trading accounts. However, I personally like Zerodha for their low brokerage. The points for each broker have been defined so nicely. The brokerage, margin and other details explained in easy manner. Thank you for sharing with us. Nice and detailed information. Motilal Oswal is also a popular stock broker in the country. This can also be included in this list. For opening an online Demat & trading account, there are so many options these days. Different platforms support investing and trading in stocks. I feel one should stick with a low brokerage firm. Why to pay high brokerage when you have the alternative to save on brokerage charges. Hi, I had a bitter experience with ICICI direct in Bank nifty Option trading. Customer support called me and explained about 10 lots with flat price Rs.195 and made me to activate the service for life time free charges. One Wednesday, I took 5ce+ 10ce + 10pe = 25 lots of bank nifty. I did not square off positions. Next day, I had a surprise to see that they charged Rs. 2475+other charges. I called to customer care about this. They simply said that “if u carry your positions next day, you will be charged 99 per lot. It is there in terms and conditions”. Customer care only called me! They insisted me to activate this service! When Zerodha, 5 paisa and others are having flat charges on per executed order. Why these people can’t give? As valuable customer I am asking, please don’t charge more money as we are all not rich people. Our money is hard earned money. Please think if others are giving flat charges on per executed order why can’t you? Any feedback on it. Trading business is run on logic and not magic. It is not possible for all to earn huge profits in stock market. You need to pick the right stocks to earn the right profits. All this can’t be learnt in a single day. It took me years to know this strategy. Opening a demat & trading account is just the starting point. The actual work begins after that, if you wish to be a frequent trader in stock market. Very Informative article on popular Demat accounts in India. Please do Edelweiss brokerage charges comparison with zerodha since I need to decide. I am currently a user of Edelweiss. Any switch over option available? Any suggestions on it.